Sh 2-161 is a large diffuse nebula surrounding the much smaller (and better studied) Sh 2-158, which is visible in the bottom right of this image. Curiously, however, the distance estimates given in the scientific literature for the two nebulae are almost identical despite the quite different velocities quoted for the gas in this direction. This is the Bubble nebula, NGC 7635, a circular shell around the O6.5 IIIf star BD +60°2522. The nebula also contains the infrared cluster [BDS2003] 44. You can see the faint nebulosity around the Bubble in this Astronomy Picture of the Day. The Bubble nebula is also bright at radio frequencies. According to Avedisova, this nebula is ionised by the O 9.5 V class star LSI +60 8. It contains the infrared cluster [BDS2003] 45. Russeil combines Sh 2-163, Sh-164 and Sh 2-166 into a single star formation region. The nebula can be seen as a faint ring in this MSX infrared image. According to Avedisova, this nebula is ionised by the B1 Ib supergiant LS I +59 10 which agrees with the class given by SIMBAD. Russeil also identifies it as the ionising star but gives a B0.2 II giant class. Ionised by the B0 V star BD +61 +2494 and contains the infrared cluster [BDS2003] 46. This nebula has a prominent ring structure in infrared as can be seen in this MSX image. 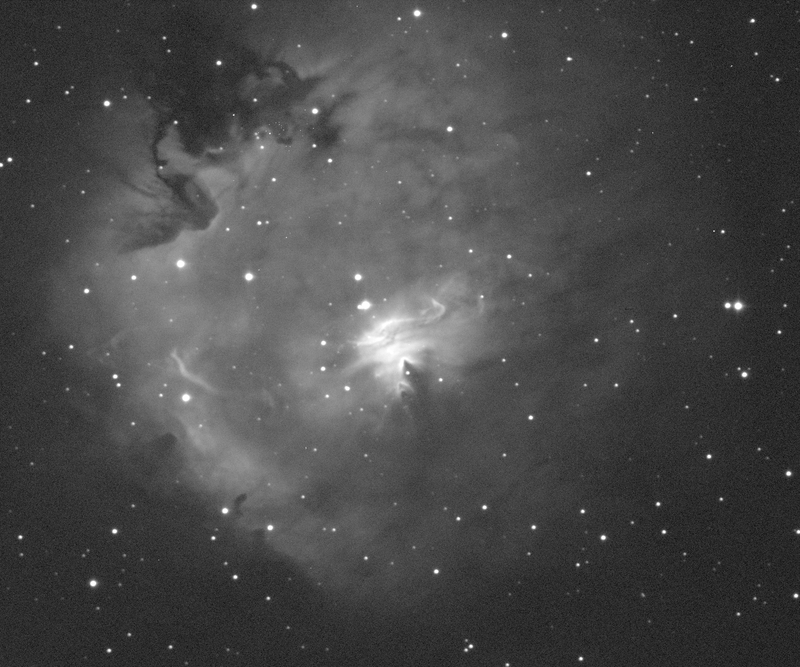 This faint nebula, ionised by the O9.5 V star BD +60 2607, forms part of the Cas OB5 supershell. Avedisova places it in the star formation region SFR 114.63-0.79 along with a water maser, the radio source KR 82 and the young stellar object Mol 160. A recent Spitzer study concluded that Mol 160 is 3000 times more luminous than the sun, is accreting matter from a 220 solar mass dust cocoon and has not yet undergone hydrogen fusion. There is very little information in the scientific literature on this faint nebula. Sh 2-167 was previously listed as a planetary nebula but is now believed to be an HII region. It appears in the direction of a large expanding shell around Cas OB5, but the available distance estimates suggest that it may lie much further away in the Outer/Norma arm. The nebula can be seen in infrared in this MSX image. Avedisova concludes that the HII region Sh 2-168 is ionised by the O9 V star LS I +60 50. SIMBAD gives a slightly cooler B0 V spectral class. This is in the direction of an expanding shell surrounding Cas OB5. Avedisova places Sh 2-168 in the star formation region SFR 115.80-1.60 along with the radio source KR 84. The nebula includes the loose infrared cluster [BDS2003] 47 and the Herbig-Haro object GM 2-44. You can find a more detailed colour image here and a black and white hydrogen-alpha image created from IPHAS data using the process described here. This nebula is quite bright in infrared as this MSX 8μm image reveals. A faint nebulosity near the direction of the much brighter Sh 2-168. Avedisova finds that it is ionised by the B0 III giant BD +59 2786. Sh 2-170 lies in the direction of the Cas OB5 supershell. There is some confusion about the designation of the ionising star. A 1995 paper concludes that the sole exciting star of Sh 2-170 is DM +63 2093, an O8 V star of 31 solar masses. Avedisova agrees on the star but gives a slightly cooler O9 V class. Curiously, SIMBAD gives a G5 spectral class for this star. Reed gives the name for the star in this location as LS I +64 11, which SIMBAD lists as the O9.5 multiple star BD +63 2093p. A 2004 paper agrees on the BD +63 2093p designation and agrees with Avedisova on the O9 V class. This paper also says that BD +63 2093p is a member of the small open cluster Stock 18 and estimates 910 +/- 90 solar masses for the hydrogen gas in the nebula. A wider view of this object can be found here.